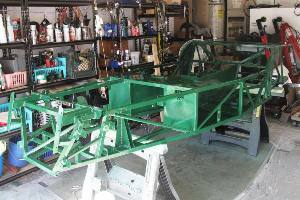 The chassis is all painted. We may have said that before, but this time it counts. It's not the greatest paint job in the history of automotive paint jobs, but we'll take it. We're definitely not painting it again. Instead we're now anxiously waiting for the paint to dry, and not surprisingly there seems to be very little we can do to speed up the process. On a positive note, we did some online research and it turns out there is no official definition of "dry". So we get to make that call ourselves. After 24 hours we found we could touch the chassis without anything sticking, which allowed us to set things on the frame so long as they didn't weigh too much. After 48 hours we could accidentally scrape things against the frame without pulling up paint, so that was another big milestone. 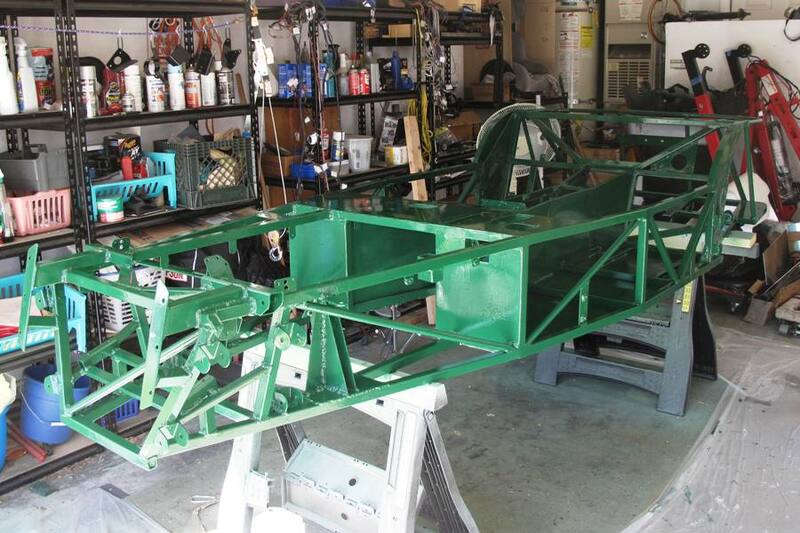 It's now p-day plus three, and we're able to do pretty much anything we want on the chassis except torque bolts. This allowed us to start routing brake lines. 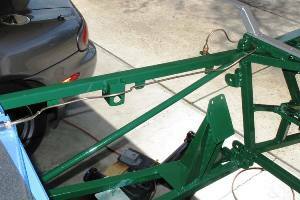 At one time, early on in the build, routing brake lines seemed to be way beyond our automotive skill set, and likely to bring the whole project to a screeching halt. Nothing we've done in the past year and a half has done anything to change that impression. The brake system in our Locost has eight hard lines. Each line has two ends. 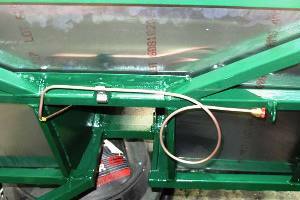 Each end has to be flared, and each end has a threaded fitting for attaching it to some kind of junction. That works out to at least 32 opportunities to screw up, and in our case probably lots more. But we need brakes, eventually, and we thought the best way to give ourselves any chance at all of avoiding some kind of high-speed brake failure was to order pre-cut and pre-flared brake lines. As luck would have it, Moss Motors had such a kit for an MGB, and we got one. The kit has its ups and downs. Among the ups is the pre-flared feature and all-new threaded fittings. Each fitting has the correct thread and gender, which eliminates most of the guesswork, although not all of it, since we still have to figure out which junctions to use, and where to put them. Among the downsides of the Moss kit is the pre-cut feature. 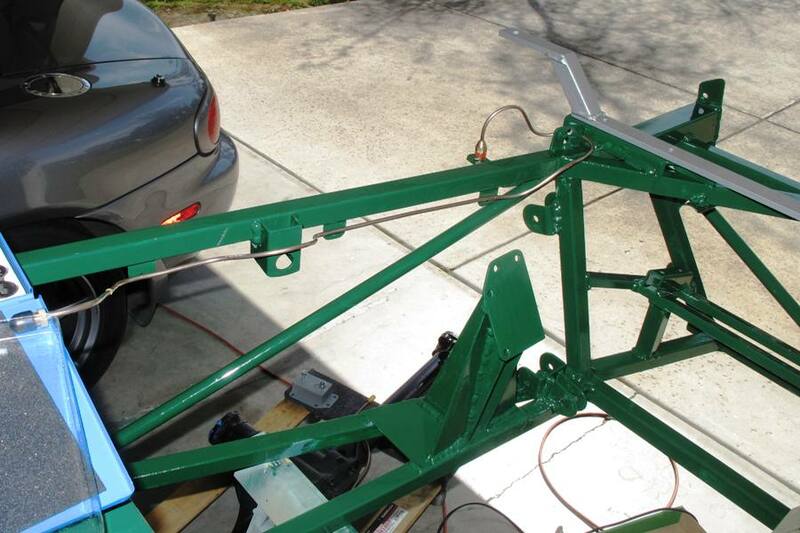 A Locost is not an MGB, and one of the ways it's not is the size of the frame and the location of the brake pedal. At first, most of the lines looked like they'd fit. 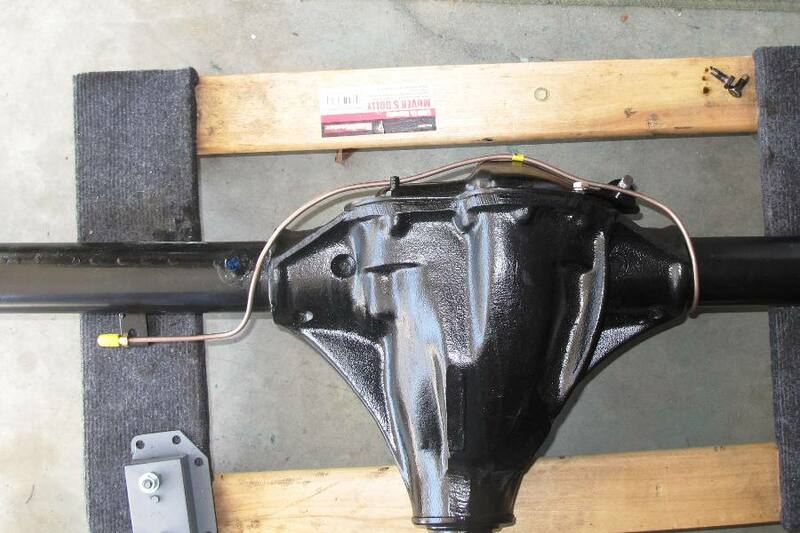 We started with the two rear axle lines, because we thought they'd be exactly the same as the originals, and it turns out they would've been if it weren't for our massive welded-on trailing link brackets. The lines were long enough though, and after a lot twisting and bending and trial fitting we managed to route them safely around the brackets. One tip about brake lines. Figure out exactly how and where you're going to run your line, and then bend your line to fit. Don't experiment and don't practice. Brake lines are nicely tempered so they bend easily, at least for awhile, but after two, maybe three bends in the same place, the line work hardens, getting more brittle. This is a property of metal that has to do with how the atoms move around when you bend it, and it's not important to know the details, but it is important to know that when a line starts to work harden, you're done. We knew that fitting the left front brake line was going to be a stretch. Literally. We practiced making the line a few months ago by re-bending the original brake line, and we came up about half a foot short. Luckily the line in the Moss kit had a little more slack, and we were also able to move the main brake junction a little farther to the left, so the line fits although it reaches across an open space for a short ways. Not a big deal. On the right front brake, the line was a little too long, but it turns out that's a lot easier problem to work with. The two lines that connect the rear brakes with the main brake junction were way too long, by at least five feet. The lines are each six or seven feet long, and the distance between the junctions in the Locost is only about eight feet total. Each of the new lines had different end fittings, and they have to join using a connector that comes with the brake kit. So you have to use both lines. Cutting lines would be out of the question, since that would involve the dark art of flaring and the consequential high-speed brake failure when you least expect it. So we needed another option, and we decided to start by putting a loop in the rear line, out of the way behind the rear bulkhead where no one would notice. We were pretty excited to find that we were able to take a whole foot and a half out of the length of the line with just a six inch loop. We're not a hundred percent sure about this, but it almost looks like there's some kind of fixed relationship between the size of a loop and the amount of line it uses up. Based on our experience we think the relationship is about 3-to-1. Maybe a little more. But one loop wasn't enough. With the rear brake line now terminating in the middle of the transmission tunnel, the front line was still way too long. We knew there wouldn't be any room in the transmission tunnel for loops, what with all the other lines and pipes and wires and not to mention a massive driveshaft spinning around and jumping up and down, so we were stuck. We had a 7 foot brake line, and we needed a 3 foot brake line. So we did what we usually do in these situations, which is to wander aimlessly around the garage feeling lost and defeated. 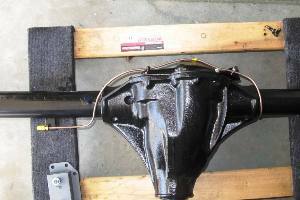 On this occasion, however, while wandering around the garage we happened to notice that the brake line for the rear axle was about three feet long. It even had the same two threaded fittings as our seven foot line. Unfortunately we'd already bent that line into shape for the rear axle, but we also knew that Moss Motors sells these brake lines individually. So we ordered one, and we hope it's the same, with all the right flares and fittings. We'll know soon enough. Incredibly, the brake lines are almost done. 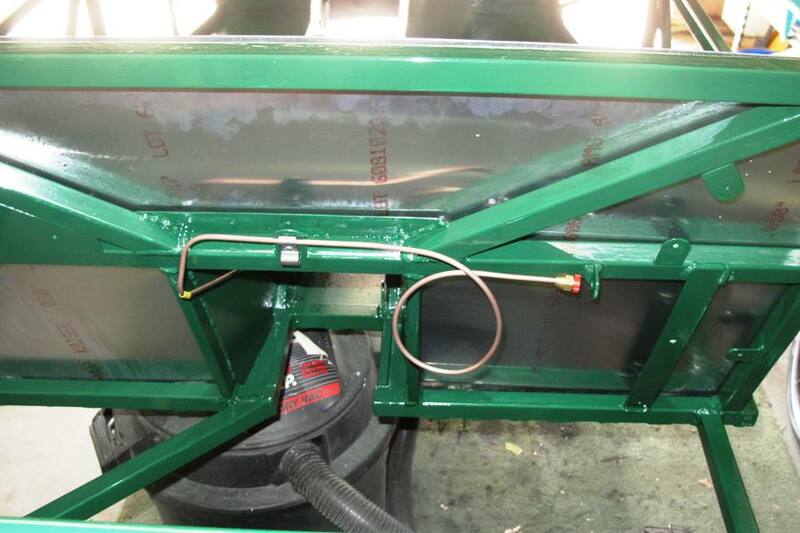 As soon as we can safely attach screws to the chassis, the lines will be secured in place and all connected to each other. We're not completely sure how we did that, but certainly using a kit helped. As a result, we're starting to believe the brakes in our Locost will actually work. There just doesn't seem to be anything magical about brake lines anymore. As we discovered with our exhaust and cooling systems, manufacturers have apparently been making these things for a while, and they seem to know what they're doing.